Mowers with a very large loading volume of 14 – 20 3. Wide verges along long roads result in a lot of clippings and extra loading capacity saves on driving back and forth from and to an unloading point. TRILO mowers are highly suitable for mowing rough terrain with a dense vegetation and with a heavy-duty flail shaft you can also mow and collect in wet conditions. Large radial tyres ensure low ground pressure and limit rutting. There are several types of mowing shafts and knives available for different mowing results. 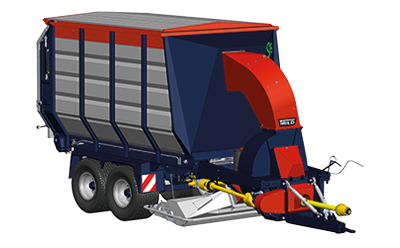 Extra large vacuum sweepers are driven by a PTO drive shaft attached to the tractor and the required output is The required hp PTO can vary depending on the working conditions.90 – 130 HP (66 – 96 kW). • Mowing and collecting in one pass. • Optional swing axles with four wheels in line. • Easy emptying with a chain floor.